Prescription drug abuse is when people misuse prescribed medicines. They may abuse their own medicine in a way that is not instructed by the doctor. This includes taking more medicine than they need or taking it when they don’t need it. Or they may abuse a prescription that is meant for someone else. Prescription drug abuse also can occur when people mix medicine with alcohol or other drugs. Prescription drug abuse is a term that refers to the improper use of medicines that are categorized as “controlled substances” by the Drug Enforcement Administration. Examples include medicines that doctors prescribe to treat pain, anxiety, or sleep. This can lead to serious problems, such as drug interactions, addiction, or even overdose. A drug interaction occurs when two or more drugs react with each other. It could make drugs less effective or cause harmful side effects. Most prescription drugs are safe and effective when you follow your doctor’s directions for how to take the medicine. 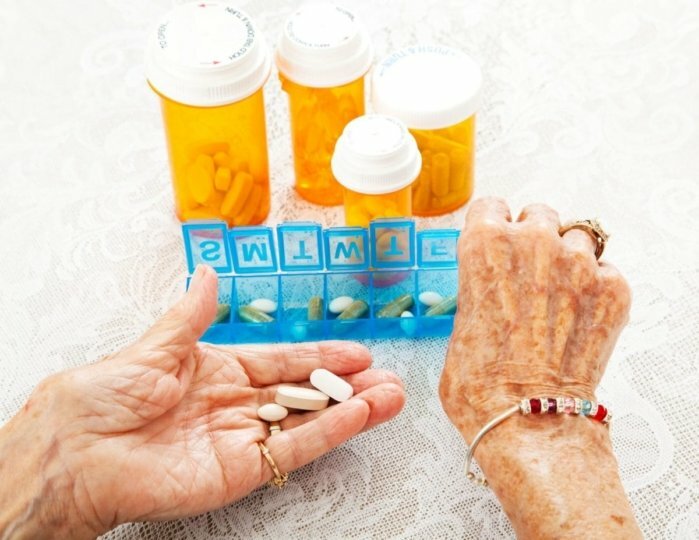 Why are older adults at risk for prescription drug abuse? Most older adults who suffer from prescription drug abuse do so by accident. They take more medicine than other age groups. According to the Substance Abuse and Mental Health Services Administration (SAMHSA), about 3 in 10 people between ages 57 to 85 use at least 5 prescriptions. This increases the risk for mistakes and drug abuse. Growing older also slows down your body’s ability to absorb and filter medicines. This means that an older adult might become addicted to or have side effects from a prescription drug at a lower dose than a younger adult. A person can abuse any type of prescription drug. Elderly adults commonly take 2 types of medicines that have a high potential for addiction. Opioids are used to control pain. Examples include oxycodone (OxyContin), oxycodone with acetaminophen (Percocet), and hydrocodone with acetaminophen (Vicodin). A person can become addicted if they take an opioid for a long period of time or take too much of an opioid. Benzodiazepines are used to treat anxiety, panic attacks, or insomnia. Examples include diazepam (Valium), alprazolam (Xanax), clonazepam (Klonopin), and lorazepam (Ativan). A person can become addicted if they take the drug for a long period of time. Symptoms of prescription drug abuse can be hard to recognize in older adults. This is because they are similar to symptoms of aging. For instance, confusion and memory loss are symptoms of both. Get a prescription for the same medicine from two different doctors. Fill a prescription for the same medicine at two different pharmacies. Take more of a medicine than they used to or take more than is instructed on the label. Take the medicine at different times or more often than is instructed on the label. Become more withdrawn or angry. Often talk about a medicine. Are afraid to go somewhere without taking a medicine. Are defensive when you ask about a medicine. Make excuses for why they need a medicine. Store “extra” pills in their purse or in their pocket. Have been treated for alcohol, drug, or prescription drug abuse in the past. If you suspect that an older adult is abusing a prescription drug, contact their doctor right away. Tell them about your concerns. The doctor will likely make an appointment to evaluate the person. They can diagnose if the problem is prescription drug abuse. The doctor also will help determine treatment. Treatment options for prescription drug abuse vary by person. It depends on what drug is abused, the degree of addiction, and the risk of having a withdrawal of the drug. Treatment may include counseling, medicine, or both. Do I take any medicines that could cause a drug interaction? What should I do if I feel like I’ve become dependent on a medicine? What is the best way to organize medicines so I don’t make a mistake? What are the symptoms for prescription drug abuse? Learn about what causes halitosis and what you can do to prevent it.